How much gender affects pay in these five most common jobs occupied by women - or any other job for that matter - is very hard to tease out since so many factors play a role. 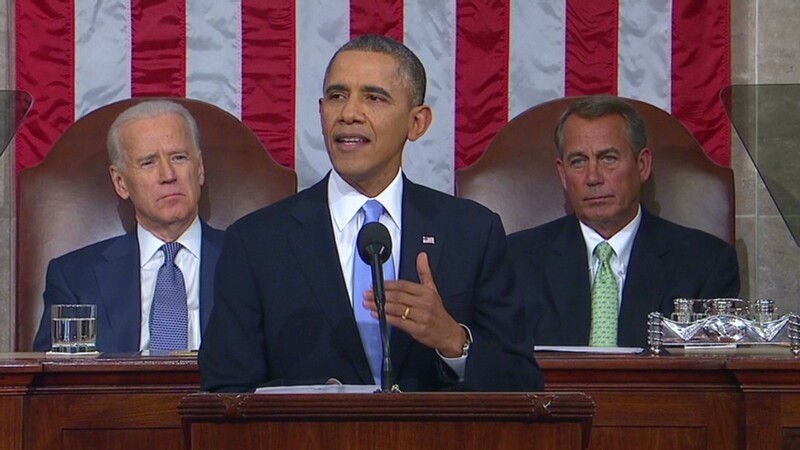 State of the Union addresses are like a tasting menu of hot-button issues. One small bite and you're on to the next morsel. 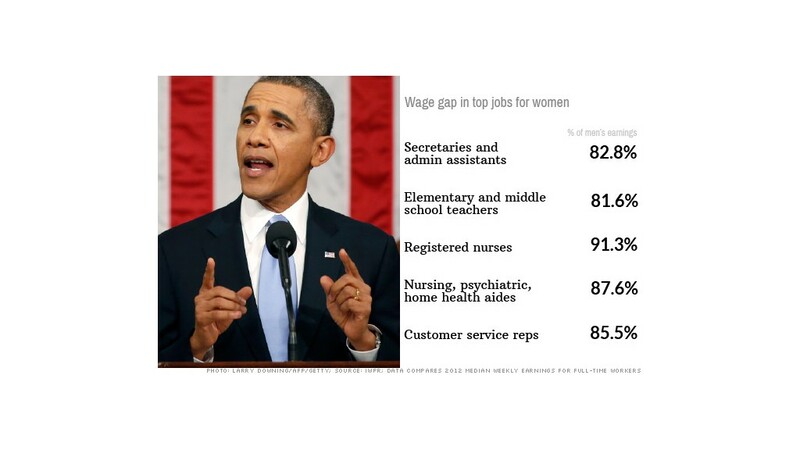 And so it was when President Obama on Tuesday touched on issues of concern to working women, with an occasional nod to men: wage discrimination, paid leave to care for family members and low-wage jobs. Pay: "[Women] still make 77 cents for every dollar a man earns. That is wrong, and in 2014, it's an embarrassment. A woman deserves equal pay for equal work." Hard to argue with that, but the 77-cents statistic does not convey the point. All it tells us is how the median annual earnings of full-time, year-round female workers compare with that of full-time, year-round male workers. It doesn't speak to any of the factors that determine one's pay, such as the type of job chosen, education, experience, tenure, or hours worked. Nor does it reflect the host of less tangible factors that play a role, such as job performance. Controlling for those factors would shrink the pay gap considerably in many jobs and in some cases all but erase it. Does that mean there's no gender discrimination in pay? No. But teasing out just how much exists is very hard. Assessments will differ depending on what methodologies are used and what specifically is being compared. The Institute for Women's Policy Research, for instance, estimates that somewhere between a quarter to a third of the 77-cents pay gap may be attributable to discrimination. Child care: "She deserves to have a baby without sacrificing her job. A mother deserves a day off to care for a sick child or sick parent without running into hardship ... ."
Here the president seems to have touched on a few issues: difficulties pregnant working women may face when trying to get or keep a job, along with a lack of paid maternity leave and paid sick leave. Employers are not allowed to discriminate against pregnant women when it comes to deciding who to hire, fire or promote. That doesn't mean they never do, though. Quantifying how widespread the problem may be is difficult, said IWPR study director Ariane Hegewisch. But, she added, pregnancy discrimination is among the fastest growing category of complaints received by the U.S. Equal Employment Opportunity Commission. Paid maternity leave, meanwhile, is not mandatory in the United States, which is one of only four countries worldwide that don't require it, IWPR notes. About two-thirds of employees don't have access to paid maternity leave, 80% don't have paid paternity leave and 88% don't have any paid leave to care for any family member, young or old. As for paid sick days, about 39% of private-sector workers don't have access, nor do 11% of government workers, according to the Bureau of Labor Statistics. The IWPR uses a slightly different methodology than the BLS, but estimates that among women alone, about 43% don't have access to paid sick leave. Jobs: "[W]omen hold a majority of lower-wage jobs ..."
Nursing aides, psychiatric aides and home health aides have relatively low pay, and 88% of them are women, Hegewisch said. Among full-time workers, women make up the majority of those in the bottom 20% of the income distribution. What's more, she said, among workers who earn the minimum wage or less per hour, women make up the majority.